Since Google officially announced the Nexus 6 known as the successor to the Nexus 5, most of fans are surprised by its new features. First of all, the 5.9 inches display and 10mm thick will make itself look like a tablet so that the large 2560x1440 QHD AMOLED display (493 ppi) is going to be great for watching videos, reading books and looking at pictures. However, different people have different tastes about phone's hardware and software configuration especially in this digital era. But, one thing is beyond dispute: 5.9 inches display will be welcomed by those people who usually watch videos or movies on mobile phones. For the sake of offline playback on the move, none of them will complain how much time will be taken on downloading YouTube videos and converting videos to handsets by video converter. Thus, spending time and energy to find a suitable Nexus 6 video converter is an absolutely worthwhile thing. Nexus 6 Video Converter Easily Solves All Video Incompatible Problems! 1. Built-in 320+ video and 50+ audio codecs, it enables you to convert any video to over 180 video formats and 14 popular audio formats on Mac OS X (Mojave included), such as MKV to AVI, WMV to MOV, FLV to AVI, AVCHD to MOV, MKV to MP4, MP4 to MP3, etc. 2. With more than 350+ output profiles, it allows you to convert any incompatible videos to Nexus 6 directly, such as convert AVI to Nexus 6, MKV to Nexus 6, FLV to Nexus 6, etc. 3. This Nexus 6 video converter also can be called as YouTube to Nexus 6 video converter. Because it can easily download videos from YouTube and convert YouTube videos to Nexus 6 at fast speed. Certainly, there is no any excuse for you to miss this functional video converter for Mac if you desire to enjoy videos on the wide-screen Nexus 6. To a large extent the Nexus 6 is compatible with those video/audio formats. Obviously, these few video and audio formats can't cater to our watching needs if we want to play a variety of YouTube videos with formats like MKV, MOV, FLV, etc. In the other hand, if you have a large collection of movies in Nexus 6 unsupported video formats, you also can't normally playback them on the Nexus 6, such as play AVI movies on Nexus 6. 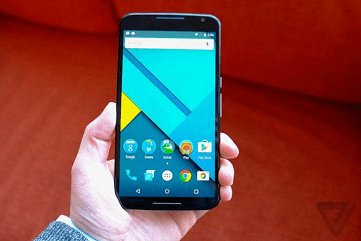 Anyhow you need convert video to Nexus 6 so as to watch them at any time. Step 1: Launch the Nexus 6 video converter and then click "Add Files" to load the video you want to convert. 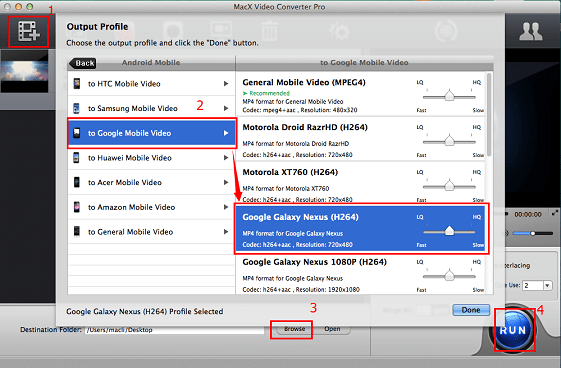 Step 2: Choose a video format for Nexus 6 from the drop-down list, like MP4, AVI, or M4V. Or you may just choose the device in "to Google Mobile Video" directly. By the way, you also can choose iPhone 6/6 Plus, iPad Air 2, iPad Mini 3, Apple TV 3, iTunes, iMovies, HTC Desire 816, Samsung Galaxy S5 mini/S5, Google new Nexus 7, etc as the output profiles. Step 4: Click "RUN" button to start converting video to Nexus 6. After video to Nexus 6 conversion completed, you can play it on Nexus 6 without any limitation. Moreover, the video converter for Mac has ability to create photo slideshow with music for you and transfer it to iPhone, iPad, Android in a few clicks.